Have a look on some of the best apps that will increase your writing skills on your android device by just devoting some of your busy scheduled time in android on these apps. If you are a Creative Writer of Professional Writer and writing for business or corporate personal is your passion, then you may want tools in which you are comfortable and can write easily and quickly. Those days are gone when you took a piece of paper and pen to write your notes. In the modern era of technology, sitting at your place, you can write your notes and even revise them further on and can finally save it on your Android Phone or Tablet. Here we will provide you some Writing Apps for Writers which will increase the productivity. So have a look on some of the best apps that will help you in your writing skills. The apps that are listed below are some the best apps that will help you to get better on your writing skills. So read the description of the apps and download and try them. The JotterPad is an awesome android app for Creative Writers. This app provides you various features to make your task easier and efficient. This plain text editor helps in writing, drafting, revising and editing your creative work. Jotterpad has the user-friendly interface that helps in writing for a long time easily and quickly and also has the clean typing interface. The built-in dictionary is the main focus point that increases the productivity. So, do prefer to download and install this app to become a good writer. Of course, for a writer, you come across new words and want to search their word meaning and even relative words to that word. A leading dictionary app i.e A Dictionary.com app can easily help in finding their meanings, finding relative words as synonyms and antonyms and stay with the latest ling. With this app, you can work offline which is free as it provides you 2 million definitions and synonyms. So just download and install the app. We can consider DropBox as one of the most important Android App for writers which help to synchronize their data that includes many files, documents, notes, images, audios, videos from your PC, Android Phone. What you want to do is create your account in DropBox and install the app on your Android phone, or you can install the software in PC and upload your files, notes, and documents from anywhere. With the Live view option, you can also the open word, excel, pptx documents. By default, you are provided with 2GB free storage, and if you want some more, you can refer to your family or friends to get more free storage. The ColorNote Notepad Notes is a simple and a lightweight Android app for Creative Writers which helps to do your task easier. Anywhere and anytime, you can easily write your note on the way you were going on and edit the unfinished works and revise to make it better. You can use colors to differentiate your group notes or to find notes easily. Evernote is the Android app available at Play Store which is a perfect app for students, business, and corporate person and especially for Creative Writers. This app can help in saving any data like notes, files, texts, images, audios, videos, etc. You can even write your notes and edit further on and revise them for final save.You can also create and save a to-do list about your writing tasks and for this can set voice reminders so that you can’t miss anything. iA Writer consciously separates form and content, text and formatting. It offers MultiMarkdown to edit and features a stellar typographic preview templates and export options. iA Writer has an integrated file browser to access all your documents. Monospace is a minimal note and writing app, built from the ground up with a designed-for-touch UI. Monospace Writer supports Bold, Italics, Strikethrough, Bullet, Quote and a bunch of size related formatting styles. Writer Plus is a handy writer app allowing creative writers to jot down quick points. Writer Plus is a writing application without the fuss and distraction of a traditional word processor. Writer Plus is perfect for writing notes, novel, lyrics, poems, essay, draft on your phone or tablet. INKredible will make writing on a tablet feel as good as, or even greater than, pen on paper. INKredible has only ONE single mission: to create an outstanding writing experience on a tablet. It is meant to be distraction-free. In fact most of the time, you will not see any UI controls or buttons, just a blank sheet of paper to write on. The familiar Word app lets you create, edit, view and share your files with others quickly and easily. It also lets you view and edit Office docs attached to email messages. Work with anyone, anywhere with confidence. With Word, your Office moves with you. WPS Office is the smallest size (less than 35MB) and all-in-one complete free office suite on Android mobile and tablets, integrates all office word processor functions: Word, PDF, Presentation, Spreadsheet, Memo and Docs Scanner in one application, and fully compatible with Microsoft Word, Excel, PowerPoint, Google Doc and Adobe PDF format. Textgram allows you to create beautiful graffiti and photos out of any text and share it with your friends on social networks or instant messaging applications, it also allows you to write on top of your photos and add stickers, frames, filters and other stuff. Users can Create, edit and collaborate with others on documents from your Android phone or tablet with the Google Docs app. With Google Docs you can open, edit and save word documents. Text Editor is a simple and powerful text editor for Android, to open and save files. It can open more files at once, as it supports tabs. You can create, write or can add rich text styling option with Text Editor. 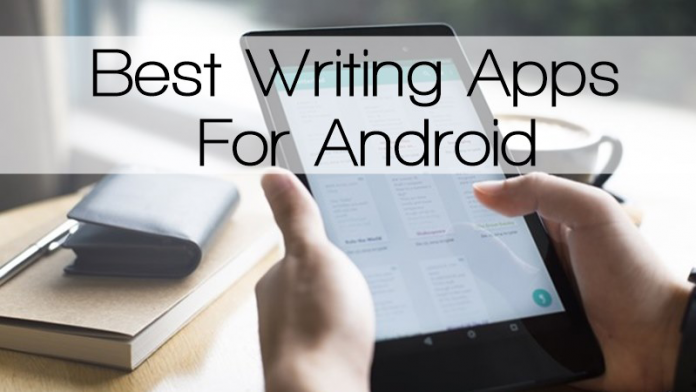 So these are the 15 Best Writing Apps For Android, Read the description of all the apps that we discussed right above and download the one that you feel more convenient to use. Hope you like the article, do share with others too. Leave a comment below if you have any related queries with this.